Set your teacher up for the best school year EVER! It is summer and, for most of us, school is nowhere on the brain. However, somewhere out there, our teachers are working feverishly to plan an amazing year ahead for our children. If you would like to make this the best school year EVER, consider gifting your teacher a World Edition Classroom Subscription. The timing is perfect for teachers to include it in their upcoming curriculum! With the World Edition Classroom Subscription, it is easy for teachers to reinforce geography, reading and problem-solving skills! 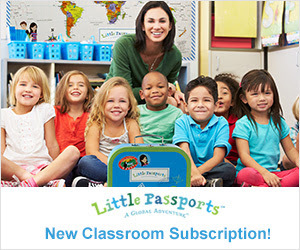 Take a closer look at Little Passports’ subscription materials and peek inside their Teacher Guides! Click here to learn more about the World Edition Classroom Subscription. Gift one to your favorite teacher for an amazing year ahead!